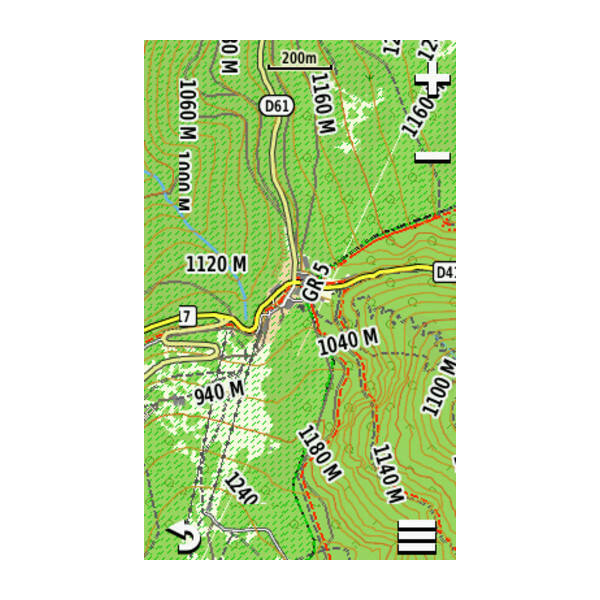 Explore all of France with detailed 1:25 000 topographic IGN French maps. 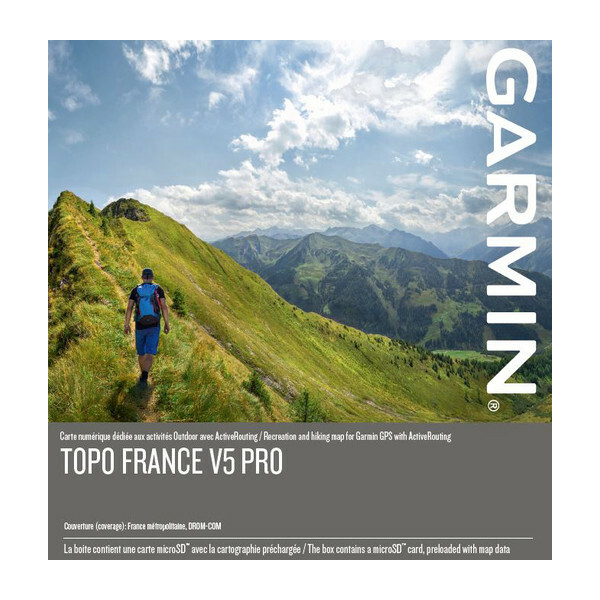 Garmin TOPO France includes paths, trails, shelters, lakes, mountains and more throughout France, Corsica and French overseas DOM-TOM territories. 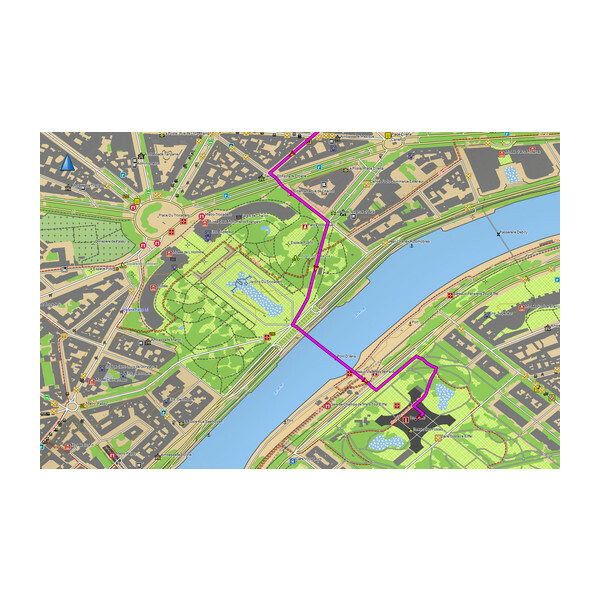 When used with a compatible Garmin handheld, car or motorcycle sat nav device the topographical map data provides essential information including; detailed land terrain contours, elevation, routable roads and rivers. 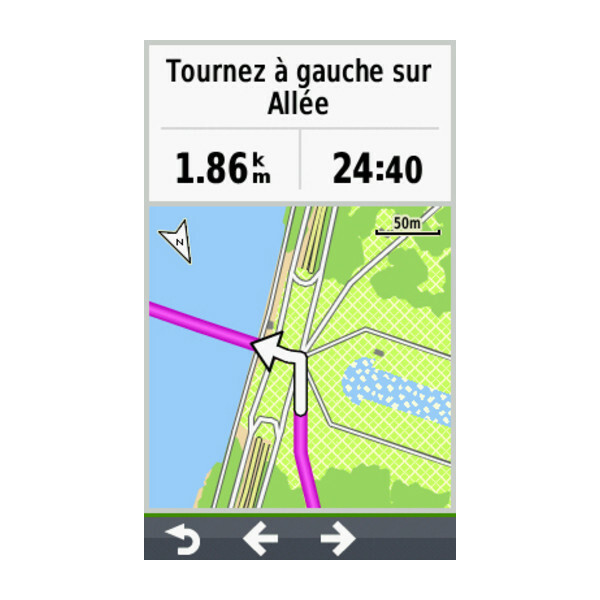 Garmin topographical maps of France is perfect if you want to explore the countryside right across France, Corsica and French overseas DOM-TOM territories. 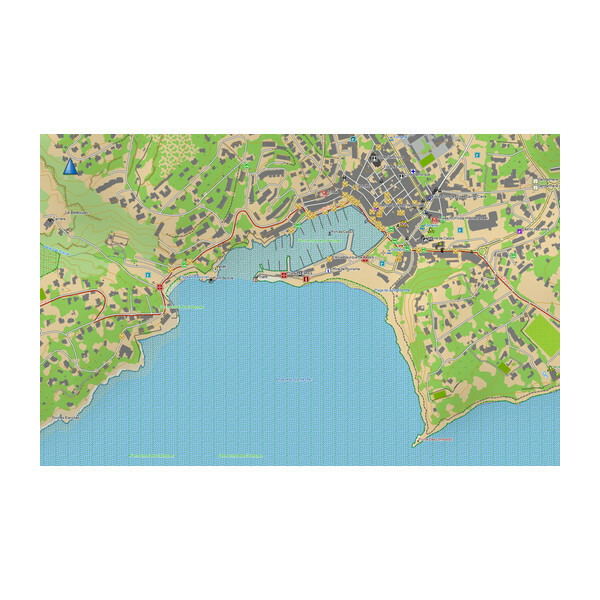 The map include detailed IGN France map detail which includes contours, elevations, mountain summits, trails, paths and roads. 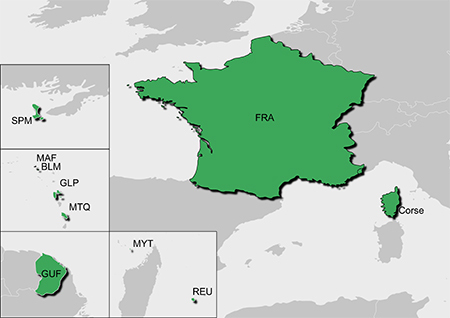 The latest v5 Pro Garmin topo map includes extended coverage to include Corsica, and the Oversea Territories (DOM-TOM) and of course all of France. 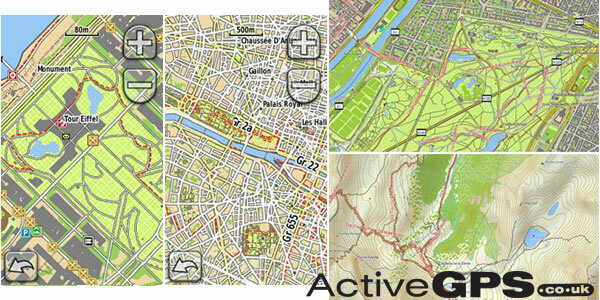 The v5 PRO TOPO France maps also features ActiveRouting - ActiveRouting enables the end-user to choose from six different outdoor recreations including: hiking, mountaineering, road cycling and mountain biking. Based on the selection the maps then provide the optimal route. Please note: This feature is only available when using the map with one of the latest systems in the Garmin handheld range e.g. Montana. Only travelling to a specific region or department in France? An alternative to the all of France TOPO v5 map it is also possible to buy one of four different regions covering different parts of France - these include: North West France, North East France and South East France and South West France. All four regional maps also come supplied on pre-programmed plug-and-play SD cards, just like the full coverage map of France. The TOPO France map on microSD/SD card provides detailed contour and elevation information for the whole of the France. 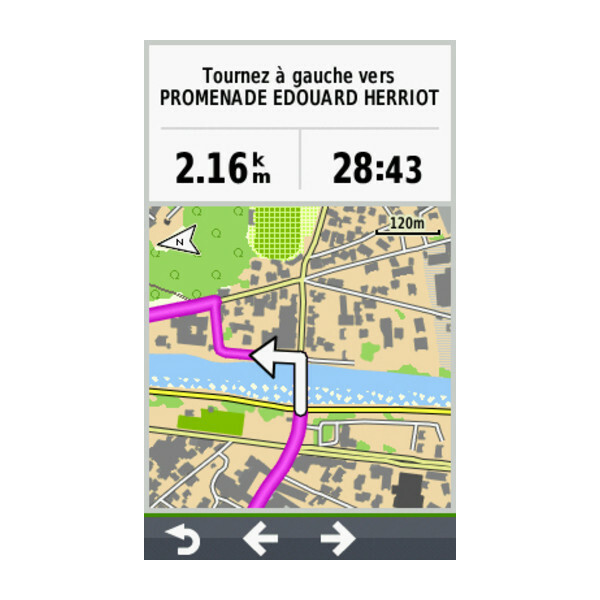 Garmin topo maps France also includes ActiveRouting which will choose the best route specific to the type of outdoor activity you are doing. You can choose from walking, hiking, mountaineering, road cycling, tour cycling and mountain biking. If you selected mountaineering it will choose a steeper, more rugged path than if you select walking. This feature is only available on particular Garmin models which are the Garmin Montana, GPSMAP 62, 64 series and Oregon devices. The all of France topographical map includes the following regions and departments of France. Regions are in bold, followed by the departments within each region. It also features digital topographic maps for the overseas territories administered by France: La Réunion, Guyane, Saint-Martin, Saint-Barthélemy, Martinique, Guadeloupe, Saint-Pierre et Miquelon and Mayotte. Nord-Pas-De-Calais - 59 Nord, 62 Pas-de-Calais, Haute-Normandie (Upper Normandy) - 27 Eure, 76 Seine-Maritime, Picardie (Picardy) - 02 Aisne, 60 Oise, 80 Somme, Ile-de-France - 75 Paris, 77 Seine-et-Marne, 78 Yvelines, 91 Essonne, 92 Hauts-de-Seine, 93 Seine-Saint-Denis, 94 Val-de-Marne, 95 Val-d'Oise, Champagne-Ardenne - 08 Ardennes, 10 Aube, 51 Marne, 52 Haute-Marne, Lorraine - 54 Meurthe-et-Moselle, 55 Meuse, 57 Moselle, 88 Vosges, Alsace - 67 Bas-Rhin, 68 Haut-Rhin, Bourgogne (Burgundy) - 21 Cote-d'Or, 58 Nièvre, 71 Saone-et-Loire, 89 Yonne and Franche-Comte - 25 Doubs, 39 Jura, 70 Haute-Saone, 90 Territoire de Belfort. Bretagne (Brittany) - 22 Cotes-d'Armor, 29 Finistere, 35 Ille-et-Vilaine, 56 Morbihan, Basse-Normandie (Lower Normandy) - 14 Calvados, 50 Manche, 61 Orne, Pays-de-la-Loire - 44 Loire-Atlantique, 49 Maine-et-Loire, 53 Mayenne, 72 Sarthe, 85 Vendee, Ile-de-France - 75 Paris, 77 Seine-et-Marne, 78 Yvelines, 91 Essonne, 92 Hauts-de-Seine, 93 Seine-Saint-Denis, 94 Val-de-Marne, 95 Val-d'Oise, Centre - 18 Cher, 28 Eure-et-Loir, 36 Indre, 37 Indre-et-Loire, 41 Loir-et-Cher, 45 Loiret. Auvergne - 03 Allier, 15 Cantal, 43 Haute-Loire, 63 Puy-de-Dome, Rhone-Alpes - 01 Ain, 07 Ardeche, 26 Drome, 38 Isere, 42 Loire, 69 Rhone, 73 Savoie, 74 Haute-Savoie, Languedoc-Roussillon - 11 Aude, 30 Gard, 34 Herault, 48 Lozere, 66 Pyrenees-Orientales, Provence-Alpes-Cote d'Azur - 04 Alpes-de-Haute-Provence, 05 Hautes-Alpes, 06 Alpes-Maritimes, 13 Bouches-du-Rhone, 83 Var, 84 Vaucluse, Corse (Corsica) - 2A Corse-du-Sud, 2B Haute-Corse. Poitou-Charentes - 16 Charente, 17 Charente-Maritime, 79 Deux-Sevres, 86 Vienne, Limousin - 19 Correze, 23 Creuse, 87 Haute-Vienne, Aquitaine - 24 Dordogne, 33 Gironde, 40 Landes, 47 Lot-et-Garonne, 64 Pyrenees-Atlantiques, Midi-Pyrenees - 04 Alpes-de-Haute-Provence, 05 Hautes-Alpes, 06 Alpes-Maritimes, 13 Bouches-du-Rhone, 83 Var, 84 Vaucluse. Please note: The first image above is a screen shot from a PC, while the two other images are taken from a Garmin handheld unit. TOPO All of France PRO mapping comes supplied on a microSD inside a larger SD card adaptor. To install insert either the full size SD or microSD card (depending on model) into a your Garmin's SD card slot.